Before leading the Canadian divisions of two separate technology giants, and delivering keynotes in front of thousands of people at trade shows, Michael Murphy helped create and maintain the federal government’s .gc.ca domain, allowing industry experts to access the federal budget online for the first time. It was a significant breakthrough, and helped solidify the case for the web among the public sector community. “That’s going back many years,” said Murphy, the former country manager for Symantec Canada, a post he held for most of his career before moving on to a similar role with Citrix Canada. Technological innovation for the past three decades has pulled the channel in all sorts of directions, resulting in a value-add community that is well-versed in both hardware and software. And from a security standpoint, Murphy watched the Canadian channel navigate some of the world’s most dangerous computer viruses, and emerging technologies. We recently spoke with this year’s recipient of CDN’s Top 100 Lifetime Achievement Award. Michael Murphy’s great-great-great grandfather, George Bryson Sr., helped establish the Bank of Ottawa in 1874. Bryson served as the bank’s director until 1900. His son George Bryson Jr. continued as a director until the bank was acquired by the Bank of Nova Scotia in 1919. Prior to the acquisition, The Bank of Ottawa issued notes from 1874-1913. Many of the notes (including a $4 bill) had George Bryson Sr.’s photo and signature. Murphy is a multiple CDN Newsmaker award winner. Citrix’s Top AVP of Americas award winner in 2012. Citrix’s Top AVP Worldwide award winner in 2013. He’s also been a guest columnist for The Globe and Mail, and was the chair of the Canadian Committee – Canadian Alliance Against Software Theft (CAAST) – now called The Software Alliance (BSA). It was 1995 when Mountain View, Calif.-based Symantec Corp. came calling looking for people to lead its growing operations north of the border. Murphy answered that call. He packed his bags and moved from Ottawa – where he was born and raised – to Toronto to work as a systems engineer, marking the beginning of his long tenure in the private sector. During his time at Citrix Canada, Michael Murphy helped open a brand new office for Citrix in Canada. He also helped to make the Canadian operation more of a cloud player than ever before, and strengthened its relationship with Microsoft. 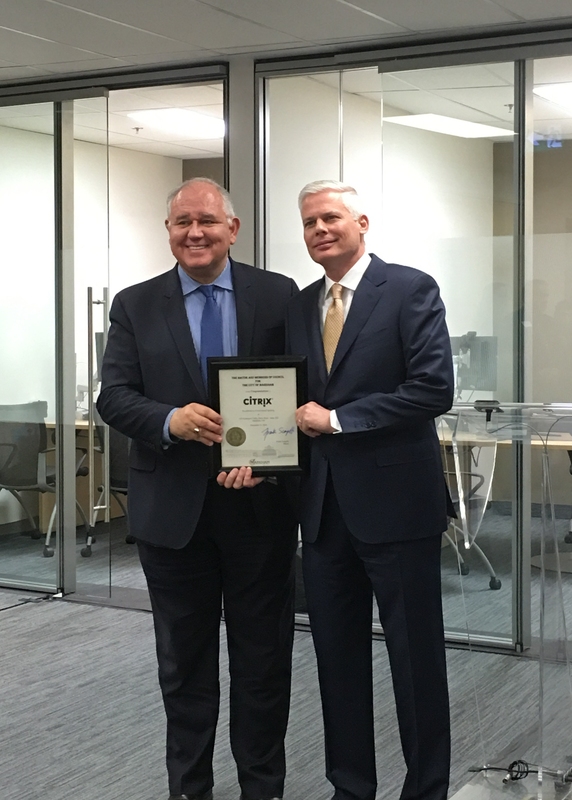 Pictured above, Markham Mayor Frank Scarpitti with Murphy at a Citrix office opening in 2016. And in the cyber security space, threats were escalating along with the dot-com boom. Before the turn of the century, cyber threats began to creep through email attachments. Murphy recalled the Melissa virus in 1999 making its way around the online space, disabling security features in Word 97 or Word 2000 and using the user’s address book to spread further. That was shortly followed by ILOVEYOU, which attacked millions of Windows PCs in the spring of 2000. “And then they started to get a lot more serious,” said Murphy. He pointed to Code Red and Nimda, which began targeting internet servers, and then Stuxnet, the mysterious computer worm allegedly written by the U.S. and Israel to compromise Iran’s nuclear program in the mid-2000s. Murphy then witnessed the rise of mobile technology, and while the real targets were PCs, networks and servers, he understands why mobile devices to this day are attractive targets. Manufacturers today are skilled at building and launching devices with some kind of connectivity capabilities. But ensuring security is built into those devices from day one? Not so much. “Time to market always wins out. So there’s always going to be some breach, capability of breach, or vulnerability once released. Further vulnerabilities will be exploited as software is updated,” said Murphy. Statista predicts that by 2020 there will be 30 billion connected devices globally. That number is expected to grow at a rapid pace every year after, opening the door for channel partners to come in and create sense out of the chaos for both the vendor and end user. This shift is happening to many partners across Canada, further fueled by the potential of artificial intelligence and machine learning. “And now obviously the interest in AI and ML has created, I think, a new vector for traditional partners to add more capabilities to their portfolio and expertise,” he said. Leaving the 80-hour work weeks behind has allowed Murphy to enter into an advisory role for multiple clients. “I’m enjoying the flexibility,” he said. His family sees him more, and so does the golf course. But when he is on the clock and talking with the channel community, Murphy explained the conversations are often about how a partner can successfully sustain a contractual business. Leading conversations about security while working full time in the channel is one of Murphy’s most cherished memories. Having a lot of those partners continue to reach out to him to talk about the industry has been humbling, he adds.